A great tea recipe to help boost your fertility and help you get pregnant. Parts can be a cup of each, a table spoon or pounds, it matters how much herb you have. I like to make large batches and store it in tins so my tea is ready any time that I need it. Use 1 T. of the blend to one cup of water. Bring to a boil and quickly turn off and cover with a lid, let sit for 5-10 minutes. Enjoy! Use 4T. of the tea blend with one quart of boiling water. Put both into a glass quart jar, put a lid on it and let sit 2-4 hours. Enjoy room temperature or refrigerate. Drink throughout the day. Hello can I add vitex to this herbal mix? If so, how much? Can this be helpful for somebody suffering from pcos and endometriosis? Can you please tell me if this looks okay to you> 1 tsp stinging nettle leaf, 1/2 tsp red clover, 1/8 tsp mint, 1/4 tsp oat straw etc to 1 cup of water? Is drinking this once daily okay? How long is it okay to drink this tea? Is there a certain time to start and stop drinking this tea? Vitex can be combined with this herbal tea. Vitex general suggested use is 500-1000mg daily. The tea blend you shared looks fine. It can be made in larger quantities and 1 Tablespoon used per cup, and 1-3 cups can be consumed daily. It is a combination that can be consumed long term as it is nourishing. There is no specific time the tea should be started or stopped really. 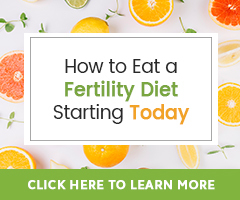 With all that, there are other things to consider as we share in our guides How to Reduce the Damaging Effects of PCOS on Fertility Through Diet and Herbs and 3 Things Women With Endometriosis Should Be Doing Daily. I hope this is helpful and if it would be helpful to have support in creating a natural fertility program for your needs, please learn more about a Fertility Consultation. Where can I buy this tea? The herbs for this tea can be purchased from any reputable source – Mountain Rose Herbs or Pacific Botanicals are two of many – and blended at home. To my knowledge this is not ready made for purchase. Hi, is red clover ok to take when you have endometriosis? I heard it has an estrogen effect? Red Clover in an herbal infusion (strong tea) is not known to elicit an estrogenic effect. It is not contraindicated for those with endometriosis or any estrogen-dominant fertility health issue. Red Clover is known as a phytoestrogen, but it also have superior nutritional benefits as well. The superior health benefits far outweigh any concern for increasing estrogen in the body. They may actually protect our bodies from xenoestrogens. I encourage you to learn more about Red clover here as you continue to decide if it is right for you. I want menses to restore back. If menstruation can come back may depend on why it has stopped. There can be many factors contributing to the cessation of menstruation. The article How To Get Your Period Back will share them, as well as tips to consider if there is a possibility of menstruation returning. Great question! Yes, discontinue the Red clover. Here’s to a successful two week wait! Where is the best place to buy loose herbal teas? I’m not a tea drinker. Thx! Loose Red Raspberry Leaf tea is available from the Natural Fertility Shop. Many co-ops and natural food stores sell bulk loose herbs, and although we are not affiliated, Mountain Rose Herbs is a reputable source for loos herbs as well.